Inside as well as outside the crypto/blockchain space “mobility” is currently a topic that receives a lot of interest. In this post, we take a look at what is going on inside the crypto/blockchain space in regards to mobility with everything around it (autonomous cars, mobility providers such as car sharing apps, related infrastructure, and similar topics). Most of the projects in the space range a still very young. The oldest (measured by when their token sale was finished) date back to September 2017. 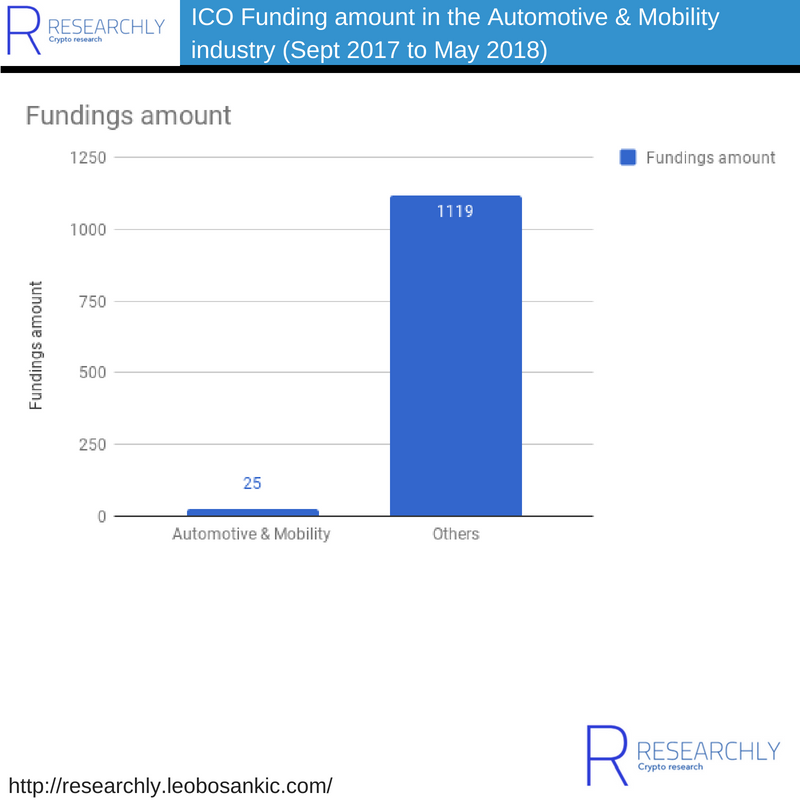 In that time about 25 ICOs were conducted that can be classified as belonging to the Automotive industry. At the same time, approximately 1100 ICOs were conducted in other industries. 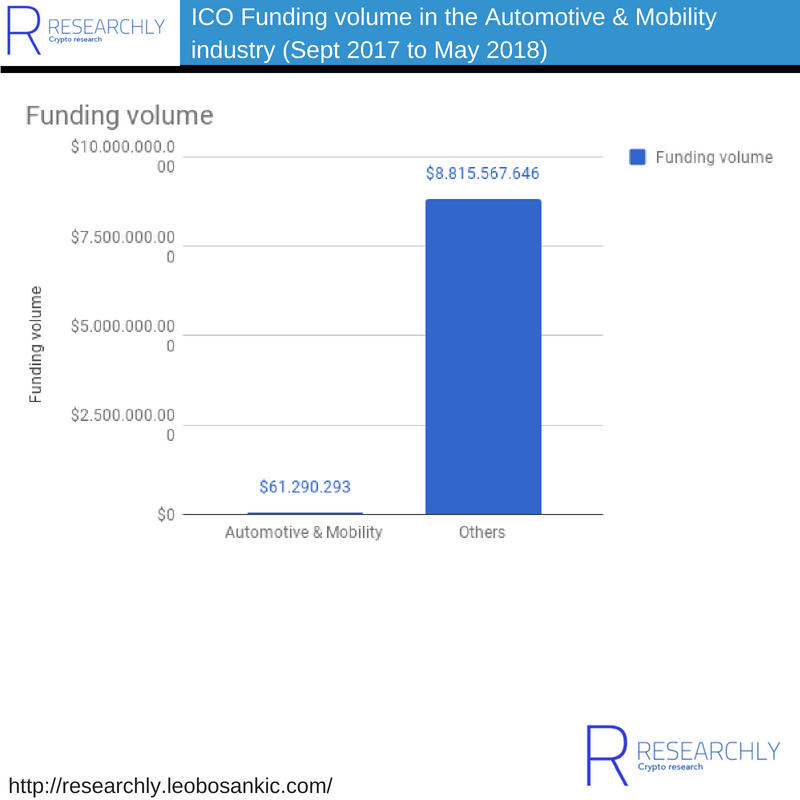 Similarly, the Automotive sector raised about $61 Million in that period, and all the other ICOs combined (excluding Automotive) raised around $9 billion. The data can be access here. It should be noted that Researchly currently does not track all ICOs. However, because the sources that I track are industry-agnostic, it is reasonable to believe that the dataset does not contain a tendency towards an industry. Also, the above-noted funding data contains only finished ICOs. Additionally, as will be shown below, it is difficult to attribute one project flawlessly to one industry. Finally, it must be noted that I lack funding data for some projects from the Automotive industry. However, their presence won’t impact the significant difference to the rest of the market. This being said, here are the themes that emerged from the projects. As expected, for many blockchain projects, data plays a huge role. One very common theme is the separation between the data and the application layer. In most cases, data (e.g. driving patterns) produced by cars and mobility applications reside within the application that captures it (e.g. Google Maps). A range of startups is developing “mobility blockchains” that store all the data produced by cars and mobility-related services. The advantages differ based on the type of data, but generally such mobility blockchains make the data more open so that more people can utilize it more easily (e.g. build a P2P car sharing app without first bootstrapping drivers and passengers) and giving people more sovereignty over the data so that they can decide who uses which of their data and what the really truthful data is. For starters, there is location data. So-called Proof of location services are working on alternatives to existing maps such as Google Maps or OpenStreetMap by storing location data on the blockchain. This makes geospatial data manageable by outsiders (the community can verify and add locations such as points of interest) and fully publicly available (using commercial maps like Google Maps is bound to certain requirements and most commercial maps do not offer raw geodata for further experimentation). Furthermore, trusted location data enables the creation of virtual toll gates or precise location-based fees or taxes. Companies working on Proof of Location inlcude Platin, FOAM, and XYO. In addition to location data, blockchain-based car databases store car lifecycle data such as repair records, accident history, and mileage on the blockchain. This increases transparency (e.g in the market for used cars) and prevents fraud like odometer manipulation. As implied above, if the data is decoupled from the application that generates it, users can exchange that data more easily. This leads to the creation of data marketplaces. A range of startups is working on data marketplaces where individuals and organizations can trade mobility-related data. One interesting use of such data marketplaces is the accumulation of training data for autonomous cars in what is often called “decentralized machine learning”. Self-driving cars suffer from a geographical bias towards the area where they are manufactured and trained. A car manufactured and trained in the USA might have troubles driving on Asian or European roads. Data marketplaces with driving data from all around the world, can help combat such biases by providing the right data. Furthermore, a data marketplaces for driving data gives car manufacturers access to the huge amount of data needed to successfully train autonomous vehicles. Companies enabling dece include Ocean Protocol, Streamr, and weeve. Several startups are working on Mobility Operating Systems. Such Mobility Systems integrate all mobility providers (in the broader sense) into one network. Examples for mobility providers are providers of shared vehicles (car/biker/scooter sharing companies), payment processors and banks, mechanics, infrastructure providers (roads, tolls, parking spots, charging stations…), insurances, telco companies, public transportation, car manufacturers, and government agencies. Companies working on Mobility Operating Systems are Mobility Operating System (Mobility OS) and Open Mobility System (OMOS). Such Mobility Operating Systems should make „mobility“ more open and frictionless. Frictionless centers around the idea to enable users to use one app to get from A to B despite switching between several payment processors, mobility solutions (e.g. cars, bikes, and public transportation), and tariff zones (e.g. traveling outside the city). This also implies that the communication between machines (e.g. cars and other cars or cars and toll stations) works similarly seamlessly. Open centers around the idea of separating the application layer from the data layer (see below). Autonomous cars are becoming increasingly mainstream. In addition to self-driving, autonomous cars are more and more seen as self-sustaining. They have their own wallets and can completely take care of themselves by earning and spending money autonomously (e.g. by participating in car sharing networks, deliveries or by contributing generated solar energy to earn money and by spending money on electricity or tolls and parking). Some projects also proposed to turn cars into providers of energy and internet connectivity. Electric vehicles can feed their excess solar energy into the energy grid which can then be used by other entities. Similarly, because in the future most cars will be equipped with internet, they can serve as WI-FI hotspots when they are parked. Car- and ride-sharing is maybe one of the most well-known blockchain-based automotive use cases. There is not much to say about them except that several companies are working on them but have yet to show traction. For the sake of completion, some themes must be mentioned that are not specific to the Automotive & Mobility industry but that merit inclusion because they will affect it nonetheless. Deposits for rental agreements (e.g. when renting a car) and their terms can be stored on a blockchain. In such a setting, funds and their terms are kept within smart contracts and only released if the contract’s terms are met. Moreover, blockchain governance models can be used to for decentralized dispute settling. There are two categories of connected cars: connected in regards to direct consumers services such as streaming services (digital communication) and connected in terms of machine-to-X (M2X) communication, where the car communicates with other machines. Whereas digital communication is nothing new anymore, it was only in recent years with the emergence of autonomous cars that M2X is gaining importance. A range of startup is working on M2X to make it faster, more secure, and less complex. Blockchains allow for instant settlement of even the smallest value to several parties simultaneously and enable usage-based payments. Nearly every crypto startup from the automotive sector utilizes micro- and instant-payments. Common examples include usage-based insurance or tolls or the instant settlement of transactions in settings where multiple stakeholders are involved (such as in car-sharing networks to instantly distribute fees across insurances, car owners, payment processors, and authorities). Moreover, cars are becoming media centers; what can be done inside a car (e.g. streaming services) is becoming more and more important. Like in many other areas blockchain-based financial transactions (enabling micro- and instant-payments) are finding a use case here.